January 16, 2019 by Solstice Outdoors. Favorite three things in shop: Oboz insulated boots, Black Diamond backcountry skis, Fisher ski poles. Black Diamond Glidelite , Darn Tough, Oboz are all things he’ll dig. Why? Oboz boots are awesome! They have amazing grip and traction. I have the non-insulated Bridgers and they're really warm, so I can only imagine how warm the insulated ones are! Perfect for a winter up here. The skis and poles because I really like backcountry skiing, and these Black Diamond skis are a fun new way to experience the outdoors. The poles are really complementary to the skis. We have two pairs in our rental fleet for anyone looking to try before they buy. Tagged with oboz, darn tough, black diamond glidelite, fisher nordic. December 10, 2018 by Solstice Outdoors. Areas of expertise/interest:Traveling, backpacking. Her three favorite things in shop: Osprey Tempest 20, North Face Novelty Glacier Pullover, Gibbon Slackline. Why? Osprey packs are my favorite packs out there! This one has great versatility-- it's the perfect size for textbooks or a day hike. The North Face pullover I love! It's so comfy and warm, great as a layer or on it's own. If you haven't tried slacklining, you should! It's a great way to improve your balance, and is super fun to do with friends and family. Tagged with gear ashland wi, gibbon slackline, the north face, hydroflask, osprey tempest 20. December 6, 2018 by Solstice Outdoors. Solstice Outdoors is hiring dynamic, experienced customer service oriented Sales Associates. August 7, 2018 by Solstice Outdoors. This past weekend Phoebes were chirping while we were out putting in maple syrup taps. Surely, it’s a sign of spring. The sun is warmer, the days are longer but the snow and ice still remain. This time of year we anxiously await the melting of winter and the departure of ice in Lake Superior's Chequamegon Bay which makes way for spring rains and mud season. Mud season could at times be considered the fifth season in the northern Wisconsin where the transition from winter to spring is often times drawn out. Some years there’s still a few chunks of ice floating in the bay around mid may. Will this year be the same? Although we love winter it’s time to think spring and everything that follows. Waves. Smelting. Migration. Fishing. Paddling. Sailing. Beach combing and days spent experiencing Lake Superior, the great inland sea, transform from a solid mass of ice to a vast playground. This year we’re going to track the ice out conditions and have a little fun while we’re at it! Think you know when the ice will go out and make way for open water in the Bay? Stop in to the shop and put your guess into our Yeti Hopper cooler or comment on our Facebook and Instagram pages with the date you think the ice will move out and we will have open water in front of the shop. When the ice goes out and the waves are crashing on the beach, we will draw a random winner from all of the comments and entries. The lucky winner will be sporting a new Yeti Hopper! Posted in Ashland, Wisconsin and tagged with yeti hopper, chequamegon nay, ashland wi, chequamegon bay, lake superior. March 27, 2018 by Solstice Outdoors. Tagged with employment, gear shop ashland, paddlesports. March 7, 2018 by Solstice Outdoors. The key to outdoor cold weather comfort is layers. Consider your activity level and length you'll be outside to determine the weight of insulation needed. The best of of layering is the ability to add and remove layers to regulate your temperature for the duration of your activity. Base Layer, insulation and weather protection are the three keys to layering effectively. You'll be ready to get out there! Tagged with layering, baselayer, insulation, weather protection, outdoor gear, ashland, wi, outside, outdoor store. January 19, 2018 by Solstice Outdoors. Looking for the pefect gift for the person always on the go. You can't go wrong with a Hydroflask flip mug, BUFF and Petzl pocket knife. 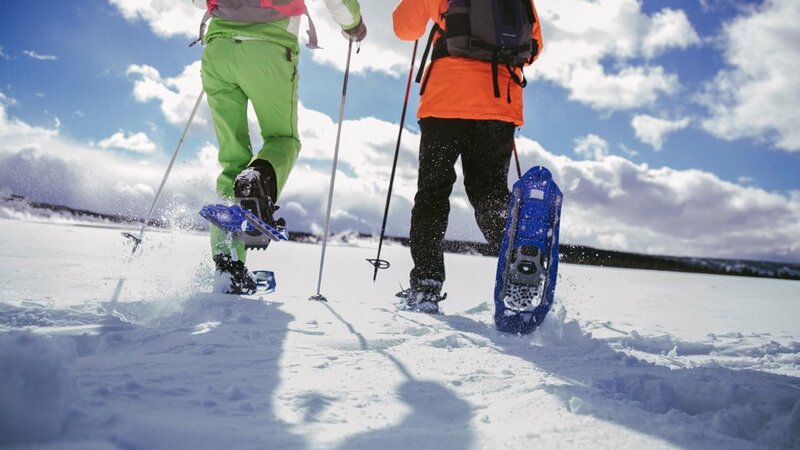 If they dig the white stuff give them a pair of Tubbs snowshoes, a Swix waxing iron or wax. It's always wonderful to get something you will actually use! Tagged with buff, tubbs snowshoes, petzl pocket knife, swix waxing iron, swix wax. December 8, 2017 by Solstice Outdoors. Our picks for all those amazing gals on your list. She's love to rock in style with a Duluth Pack Shell bag. Kick back and relax with a good bottle of wine, an Opinel knife and cork screw combo and GSI collapsible wine glass and bag. Can't decide what to get? A Solstice and Solstice Outdoors gift card is always perfect. Tagged with opinel knives, gsi wine glasses, duluth pack shell bag, amazing gal gifts, gifting. We've got cozy gifts for everyone on your list. Who wouldn't love to snuggle up by the fire in a warm and wooly Woolrich blanket and sip a cocktail from a Yeti lowball. Of course this is all after a nice hike with a Duluth Pack rucksack and trusty Stormy Kromer cap and mittens! Tagged with woolrich, stormy kromer, duluth pack, yeti. December 2, 2017 by Solstice Outdoors. Ho Ho Ho....A Solstice we will go for the best gifts! The countdown to Santa coming down the chimney is on! Only 27 days to go. Time to get gifting. We're like Santa's little elves this time of year spreading holiday cheer with our handpicked selection of some of our favorite items throughout the shop for everyone on your list. Who better to start with than those outdoorsy kiddos. Check out the Nalgene Lunch Buddy, Big Agnes Little Red, Smartwool socks, Tubbs sno glow snowshoes and Opinel junior knife and more in the shop. Tagged with outdoor kids, gift ideas ashland wi, nalgene, tubbs snowshoes, smartwool socks, opinel knives, big agnes sleeping bags, big agnes little red. November 28, 2017 by Solstice Outdoors. A slight chill in the air and the fact that October is just around the corner is triggering thoughts of autumn. It's the most wonder time of they year in the shop. We've got new clothing and gear arriving daily for hiking in the woods, late season camping and preparing for hunting season. We're excited to announce that we will be one of only a few dealers in Wisconsin carrying Sitka Gear. Sitka has turned clothing into gear that works, lasts and is so versatile you'll want to wear camo everyday! Join us for a special brand launch on Thursday, October 5th to view the waterfowl and whitetail collections. As we continue to innovate and bring new products into the store, we will continue to stock a variety of products that a essential for outdoor active endeavors such as Petzl headlamps, Yeti Tundra Coolers and the all new Load Outs...trust us it's more than just a bucket. Stop in and see all the new colors of the season in the shop. Posted in Ashland, Wisconsin, Events and tagged with sitka gear, hunting, yeti, loud out, petzl, camo, waterfowl, whitetail. September 28, 2017 by Solstice Outdoors. Be a pro and check that stove before you go. No amount of packing, repacking and planning matters more than having a way to cook that coffee and food at camp. Start your packing by testing out that old or new stove before you go. A simple check to make sure it lights and is running well at home will save you a lot of headaches on the trail. Take a few minutes to test, check fuel and clean it. Not sure how to do it. Check with your manufacturer and find easy how to videos like this one from our friends at MSR. Tagged with whisperlite, msr, stove maintenance. September 18, 2017 by Solstice Outdoors.